Venture into the tastes and aromas of Southern France with tonight’s meal. With its roots in the city of Nice, pissaladiere refers to a pizza-like dish, albeit usually rolled out until thicker than your traditional pizza, then garnished with caramelized onions and black olives. 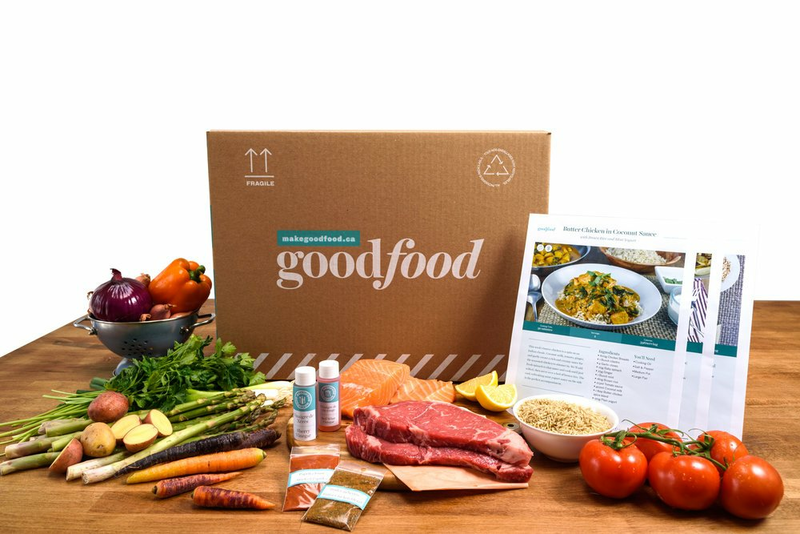 We add fresh arugula, tomatoes and a crumble of goat cheese to the mix to make this classic meal our own. A drizzle of olive oil completes a satisfying take on a regional dish. Peel, halve and thinly slice the onions. In a large pan, heat a drizzle of oil on medium-high. Add the onions to the pan and cook, stirring occasionally, 5 to 7 minutes, until lightly browned. Reduce the heat to medium and add 1 tbsp of water (double for 4 portions); season with ½ the herbes de Provence and S&P. Cook, stirring frequently, 2 to 4 minutes, until very tender. Stir in an additional 1 tbsp of water (double for 4 portions), scraping up any browned bits from the bottom of the pan; season with S&P to taste. 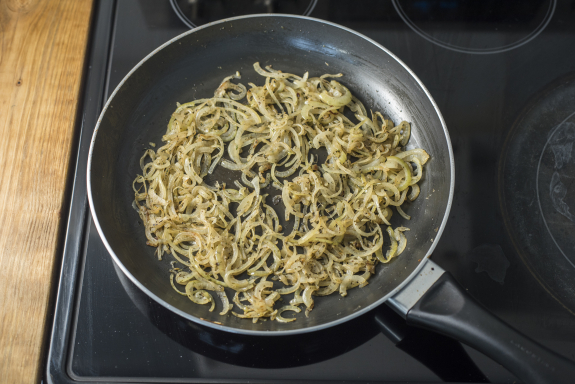 While the onions caramelize, preheat the oven to 450°F. Place the oven rack into the lower position. Slice the tomatoes into ¼-inch thick rounds. 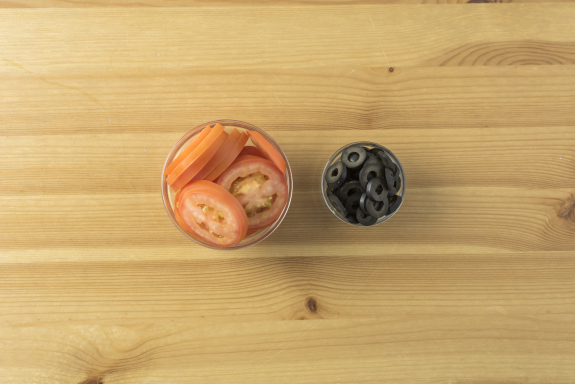 Slice the olives into rounds. Lightly brush a clean work surface with olive oil. Roll or spread the dough out until ½-inch thick. 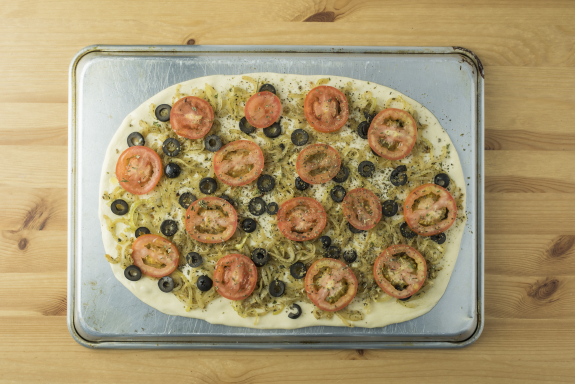 Very carefully move the dough onto the lightly greased back of a sheet pan. 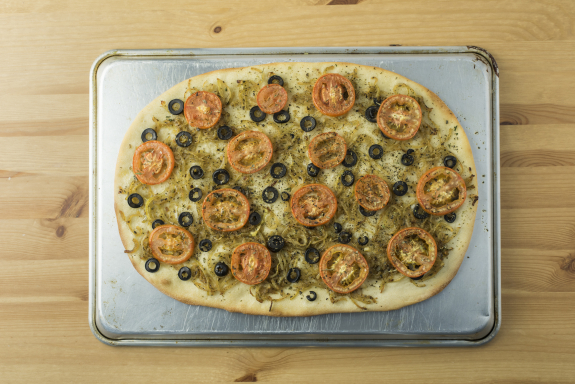 Top with the caramelized onions, olives and ⅔ of the tomatoes. Drizzle with olive oil; season with the remaining herbes de Provence and S&P. Place the pan of assembled pissaladiere on the bottom rack of the oven and bake, 18 to 20 minutes, until the dough is golden brown and crispy. While the pissaladiere cooks, in a large bowl, combine the vinegar and 3 tbsp of olive oil (double for 4 portions); season with S&P to taste. Add ¾ of the arugula and remaining tomatoes. Toss to combine thoroughly and top with ½ the goat cheese. 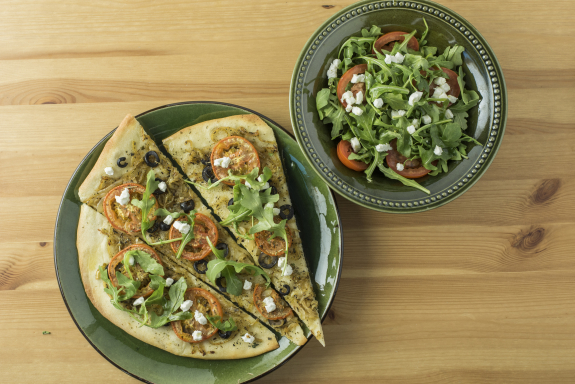 Transfer the finished pissaladiere to a cutting board; cut into wedges and divide between your plates. 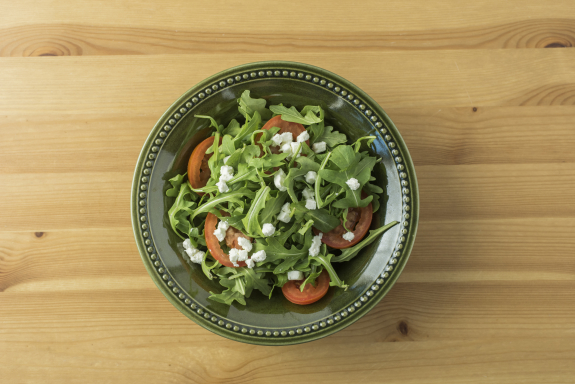 Top with the remaining arugula and goat cheese and a drizzle of olive oil. Serve the salad on the side. Bon appétit!